This soup was inspired by two dishes that I enjoyed during my recent trip to St. Louis. 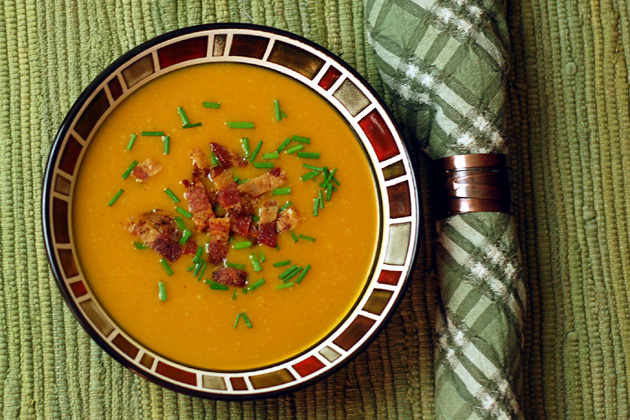 The first was a hearty butternut squash at The Farmhaus, and the second was a cheddar-jalapeno soup made with Budweiser at the Anheuser-Busch brewery. I took what I found to be the best aspects of each soup and combined them. 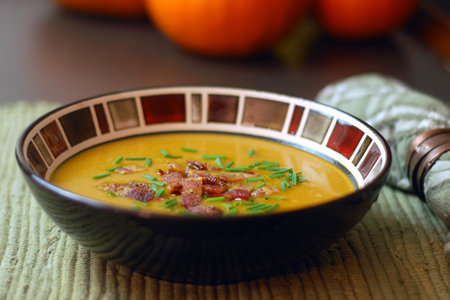 Fall is a great time for a butternut squash soup, but I thought that I could bring some beer to the party. Rather than use Bud, I chose the unfiltered goodness of Shock Top Belgian White. I felt that the soup needed a hearty beer to help cut through the natural sweetness of the butternut squash. It really worked, and I think you'll enjoy this twist on a fall classic. 8 cups Peeled and chopped butternut squash, cut to 1"
Combine the squash, oil, 2 teaspoons of the salt, pepper, ancho and nutmeg in a large mixing bowl. Toss/stir to mix well, then spread in a single layer on a sheet pan. Roast in the oven until the squash is very tender and lightly browned and slightly crispy around the edges, about 1 hour. Combine the beer, remaining 1 teaspoon salt, ginger, and cumin in a stock pot, bring to a moderate boil over medium-high heat and reduce by 1/2. Add the stock, squash and white pepper to the beer and stock liquid, simmer 30 minutes. Remove the soup from the heat and blend with an immersion/stick blender until it's very smooth. Whisk in the butter. Serve and enjoy! I served mine with a little peppered bacon and chopped chives. Quick question. About how many squash for the 8 cups? 3, maybe 4? Oh no, one large squash is all that I used for each of the two batches that I made. I'd guess that they were in the 2 1/2 lb range.